Hats and scarves are fun quick knitted projects. Quick knitted projects can be easy yet meaningful gifts, ways to use scrap yarn from more complex projects, methods of teaching new knitters basic techniques, or ways to enjoy the thrill of completing a project without worrying about complex stitches and elaborate designs. Quick projects are also a way to refresh skills with basic stitches or to experiment with new types of yarn before embarking on sophisticated handiwork. While these may seem to be limitations, there are actually dozens of different quick knitting projects that both new and experienced crafters can enjoy. These quick knitted projects can be made either by straight knitting with needles, or by using a spool knitter or knitting loom for even more ease and speed. In fact, smaller projects such as a doily or potholder may take less than an hour. Larger projects such as ponchos or afghans may take a day or more to complete, but that is still far quicker than more elaborate knitting endeavors. Add appliqué lace around the collar of a poncho, mouth of a bag, or edge of a shawl for instant elegance. 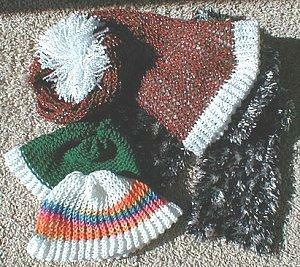 Add pompoms or tassels to the edges of ponchos, hats, bags, pillows, and blankets for a flirty and light-hearted accent. Large sequins or decorative buttons can embellish vests, bags, or scarves. Edge the project with a contrasting color or texture of yarn. Scraps from larger projects work well for this, even if the stitches are the same. Use creative yarns such as variegated colors, rag yarns, chenille blends, or skeins with metallic accents for instant variation. By creatively embellishing a quick knitted item, it is possible to add flair and style to even the simplest project with a minimum of hassle and effort. The most important thing to remember about any quick knitted project is that it should be fun. Seeing a project come together successfully can be immensely gratifying to even the most seasoned knitters, even if the project and stitches are basic. The resulting items can be immediately used, or they can be saved as emergency gifts for children, friends, and family members. Some may even be donated to worthy causes such as women's shelters, children's hospitals, or clothing drives to bring even more significance and value to a simple project.